Due To Early Industry Limitations, Silent Films Were Recorded In? Despite Advances In Technology, The U.S. Navy Still Maintains A Formation Of? If you’ve ever dabbled in film making, photography, or simply been frustrated by an underexposed smartphone photo, then you know how important light is to the process of creating images. During the silent film era, the most pressing concern was light, and with very good reason: good lighting was hard to come by. Electric lights powerful enough to be used in a studio setting were in their infancy, extremely expensive, and, more importantly, extremely hot. To avoid the expense of giant light fixtures and forcing actors to stand very close to light arrays that left them drenched in sweat, early studios turned to a solution that seems a bit odd by modern standards, but was very clever for the time: greenhouses. 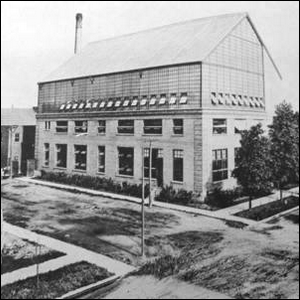 Movie studios would build huge “glass houses” (like the Selig Polyscope Company’s rooftop glass house in Chicago shown above) that were essentially greenhouses filled with actors instead of orchids. While still warm to work in, the natural light was brighter than anything early lights could produce, truer in color, and certainly cooler than standing under a bank of lights the size of a bus. Even better, studios were able to maximize the space by filming multiple films at the same time—after all, in a silent film you never have to worry about noise from adjacent sets ruining your shot.